The Hudsucker is an online magazine made up of unique and dedicated writers with fresh voices from across the country and overseas. Our team of writers are passionate and driven, bringing forth their personalities in each article. Since its inception in 2012, The Hudsucker has continuously proven how writing is our strongest fingerprint. By creating a smart and ambitious environment for readers, the digital magazine focusing on popular culture aims to be relatable through experiences and passions. What is it about Halloween that attracts so many of us? Is it fear of the unknown; what lurks in the dark? Is it getting the chance to be someone else for an evening? Or is because you just want some free candy? It’s true and an evident fact that there’s always that one person on your block with the most elaborate decorated front lawn, complete with animatronics, who has the best candy to hand out. It’s just a holiday norm and in some neighborhoods, a bit of a competition among enthusiasts but you work hard, so why not get some free candy, right? Whatever the case is, tonight many people will be celebrating “All Hallows’ Evening” by attending costume parties, lighting up their carved pumpkins, visiting haunted houses and attending ghost hunts, having a horror movie marathon or playing pranks, and of course trick-or-treating! History denotes the celebration of Halloween as a ghastly and often demonically inspired night to be avoided but as time as passed, many see the night as harmless, kiddy fun and a chance to act silly with friends and dress up for a good laugh. Here at The Hudsucker, some of us wanted to celebrate and share our favorite Halloween memories and along the way, give our own advice on the do’s and don’ts of trick-or-treating. The yearly Halloween tradition should be fun and though incites giddy excitement from kids of all ages, we feel we could enlighten a few with our own tips and tricks! Here’s a Halloween picture of me when I was about 7 years old. Gotta love the garbage bag skirt! And somehow my dad fashioned my witch’s hat from cardboard! We were kind of poor back then, so my parents had to get creative with costumes. One of my favorite memories of Halloween was later in life when my husband and I dressed up as Wayne and Cassandra from Wayne’s World. No one really knew who I was, but I got to hold a microphone, and I couldn’t stop laughing seeing my husband in a mullet wig, so that was fun. Don’t go when you’re in high school, even middle school is stretching it. Now that I’m a parent, when those older kids come to my door to trick-or- treat, I just roll my eyes at their half-put-together costumes and barely audible “trick-or-treat’s,” all they want is free candy. What I want to see are the cute little kiddos who actually view Halloween as a magical night! 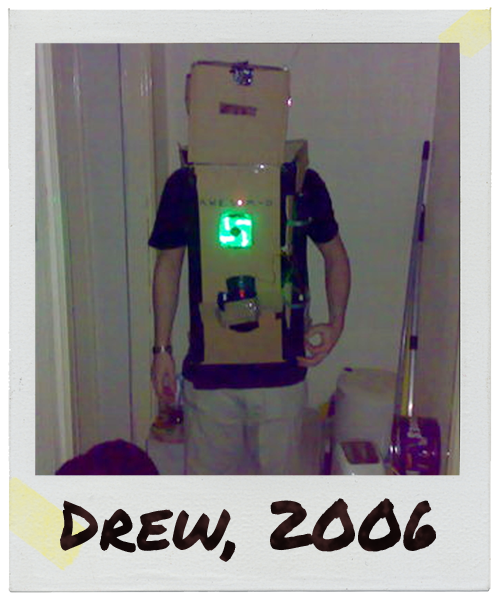 The picture is of me as AWESOM-O from South Park in 2006. This is one of my favorite Halloween memories. My best mate and I spent a day making the costume out of old PC and remote control car parts. The LED fan on the front was fully working (and needed, I wore the costume during a Halloween shift at the bar I worked at). It was an incredibly awkward costume to wear, but well worth it for the reaction of the people who got the joke! It sounds simple, but try learning an actual trick or treat. Too many people show up at the door these days and expect candy. I save the good stuff for people who put he effort in! That picture is of me and my older sister Jennifer. We were angels! I’m not sure why I’m crying but Halloween is rough for a little kid. It’s tiring. My favorite Halloween memory is when I ate too many Rice Krispie treats, that were probably orange and in the shape of a jack-o-lantern, and they made me sick. Wait. That’s an awful memory. I can’t even look at a Rice Krispie treat anymore! Or any other cereal/marshmallow treat! Cocoa Krispie treat? No! Cap’n Crunch’s Oops! All Berries treat? I wish! Oh my goodness….can you imagine Honey-Comb treats?!? I wish I could imagine it without wanting to barf. Do go trick-or-treating for a long as you can get away with it. Hold on to your youth, everybody. Hold it tight! If you’re over the age of 14, don’t bother stopping at my house unless you put major effort into your costume. I don’t want some high school football player to just put on his jersey and call it a costume. You won’t get any candy from me. Who am I kidding? You’ll get candy and a smile but I’ll be silently judging you. So, there. 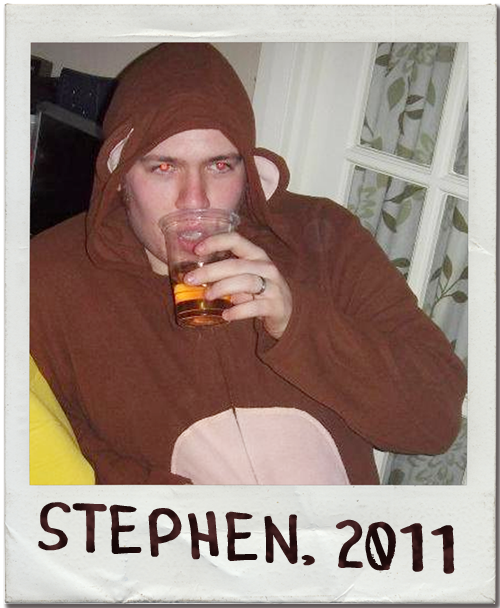 To be honest, the monkey costume was a last minute choice and the irony was that one of my best friends came dressed as a banana. One of my favorite things about Halloween is The SimpsonsHalloween specials, and one year during my Halloween party, I had every one of them playing back to back. Mostly for some background noise when I was getting ready for the party. However, I forgot to switch them off, and they continued to play. The best part was that people dipped in and out of watching causing a few laughs, and a couple of Simpson’s quote battles. Then, as the party started to fade out, we all just chilled out and finished off the rest of the episodes; until 6am! Do make an effort with your costume. It is a lot easier when you are younger, and I am sad that I let my efforts slip. Don’t eat so much candy that you will explode. You will give yourself a candy hangover and nobody wants that! 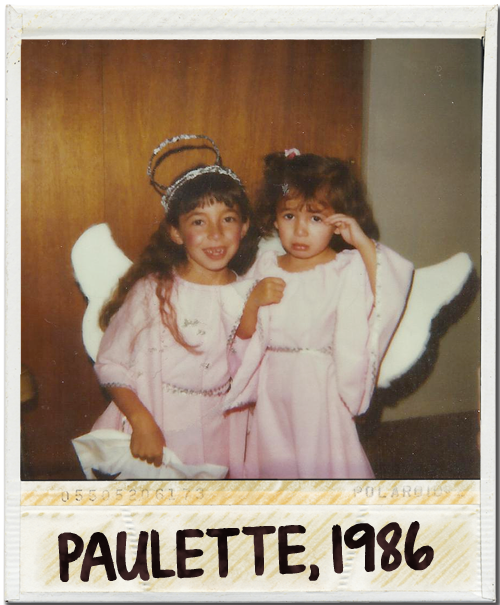 When I was four years old, I was a fairy princess in my Tot Spot Nursery pageant. I wasn’t treading Honey Boo Boo territory but I did wear a lot of rouge and sported a tiara. When I was five, I went trick-or-treating with my dad in our new town and it was an experience I really won’t ever forget. We just moved from Alberta to a small southern Ontario suburb. I didn’t make friends very quickly so my dad decided to take me out for Halloween. I don’t remember what I dressed as—I just remember how much I loved spending time with my dad; holding his hand and walking through the night with all these lit up houses, full of decorations. That all changed when I got to one house covered in faux graves, skeletons hanging from the rooftops, and pumpkins glowing near the garage. My dad had me walk up to the houses on my own and this one was no different. When I rang the doorbell to this house, a very tall man in a long cloak answered the door and screamed at me. It was awkward. At that age, you get scared and wonder, “What did I do?” and stood there absolutely frozen. This man at the door then said, “What do you have to say to me?” and I was still blank. He attempted small talk with me until his wife came up behind him, whispered and looked at me with a smile; said, “Happy Halloween!” and gave me candy. I said in the smallest voice, “Thank you” and walked away but remember grabbing my dad’s hand really hard, and basically dragging him away from the house. The nerd in me would say do eat dinner before trick-or-treating and finish your homework or any other paper work from the office before partying because you’re probably going to get wasted in ways through sugar highs and alcoholic beverages like a Bleeding Heart Martini or Blood Orange Cocktails. You’ll feel so gaggy if you’re devouring sugar on an empty stomach and that’s no good. I worry about people, so do not by any means scare the elderly or babies. Or an elderly person witha baby. In both cases, you’re going to regret it. I was running on fumes that Halloween night. I was attending leadership training in the army that weekend. We were let off on Friday and Saturday night (Halloween); I spent the night prior cutting, sewing, and fitting two Max the wolf costumes (with whatever skill I gained observing my mother patch up my trousers on the Singer when I was a young lad). We rendezvoused with some friends and hit up a gay club. Near the end of the night, I gain a sense of what it was like for folks who worked as mascots. As we were stumbling and sweating our way through the coat check line, my partner fainted from overheating and lost her cell phone (recovered later thanks to a good Samaritan). Do be that house that gives out full sized candy bars. Don’t splurge on that Halloween costume if you are only going to wear it once! Confession time: I don’t have any Halloween pictures of me as a kid. 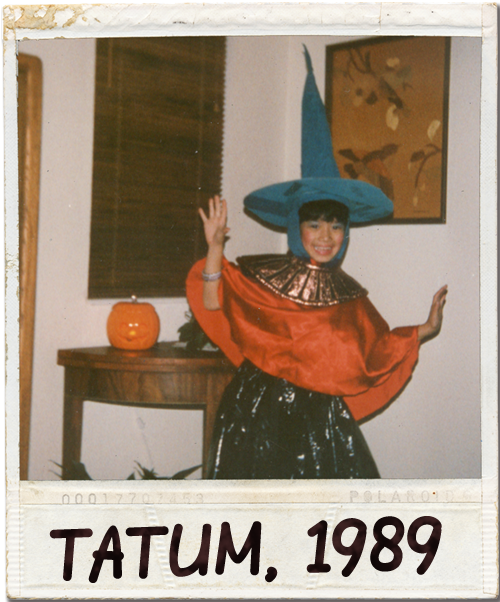 I grew up in a Hispanic culture and back in the old ages (the 90s) Halloween wasn’t a thing. 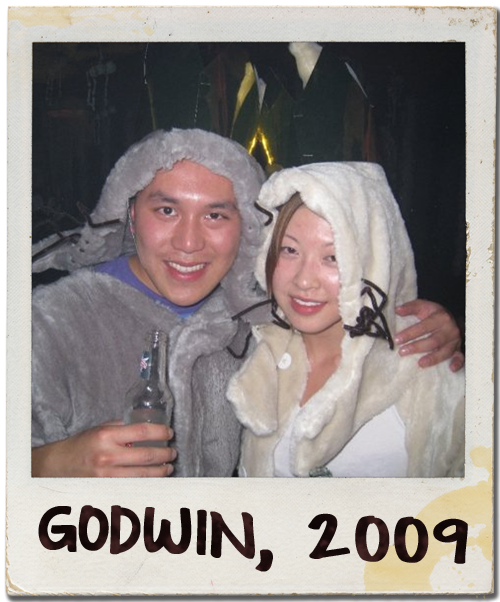 Nowadays, Halloween has caught on and teens and young adults use it as an excuse to party and dress slutty just like in any other country in the globalized world. Personally, I love Halloween! I love looking around costume ideas and I start planning my Halloween costumes a long time in advance only to forget about it, and end up dressing up as a gypsy or whatever crap I can improvise two hours before the party. I always celebrate Halloween with the exception of last year when I was in France because apparently, they refuse to do it? “Zat iz an American coztume,” my beloved and very Parisian host family said. 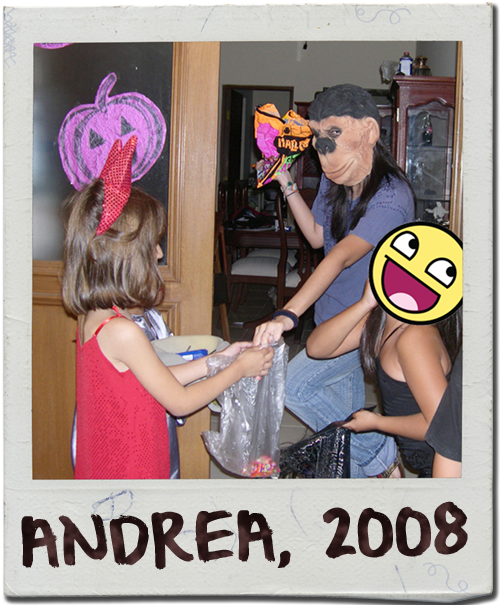 So anyway, if I had to pick a Halloween souvenir it would have to be Halloween of 2008; it was a memorable year because it was the only time I went trick or treating EVER. I spent it at my friend’s place where we handed out candy and then went with her little brother around the neighborhood trick or treating. It was a lot of fun but I had a gorilla mask as a costume (I originally intended to dress up as the Joker in his The Dark Knight purple outfit—see how my plans work out?) and nobody gave me candy and the fact than I was a 24 years old probably didn’t help either. Do wear an awesome costume: Listen children, it’s not the 1950s (or whatever you think as “a long time ago”), dressing up in something lame like a princess or a cowboy is not gonna impress anyone. Adults nowadays (at least the adults I know) are very much into a thing called pop culture so if you really wanna impress them I suggest you look into that when planning your Halloween costumes. Instead of going as a boring old witch, how about going as the now iconic botched Jesus painting from Spain? Everybody thinks Monkey Jesus is hilarious and that costume would basically be a mask and a robe so it would be cheap and work for both boys and girls and everything. Or how about the Korean guy that sings “Gangnam Style”? The outfit is not complicated but you would have to master the choreography for it to make sense. Maybe your friends won’t get these costume ideas, but who cares about friends when you have a ton of candy, right? Don’t go trick or treating on a empty stomach: Health is just as important as being awesome and you’re probably gonna get an unholy amount of candy after dressing up as Monkey Jesus so you should be careful and not eat it all right away. Here’s a shocking medical truth: too much candy is not good for you, gasp! I’m not gonna tell you to go around asking for sliced apples instead of candy because what kind of kid does that?! But you should tell your mom to make you a nice sandwich or have a big glass of milk before leaving. If you’re already full you won’t feel as tempted to eat everything in your Halloween bag. This way you’ll avoid eating too much of that unhealthy candy sugar without having to use that self-control that I know you kids don’t have. You’re welcome! My last memorable Halloween was four years ago when I dressed up as Batman from that summer’s blockbuster, The Dark Knight. I was a big fan of the film and originally wanted to be The Joker after watching Heath Ledger’s legendary portrayal of the iconic villain. I went with Batman after most Joker costumes were sold out. 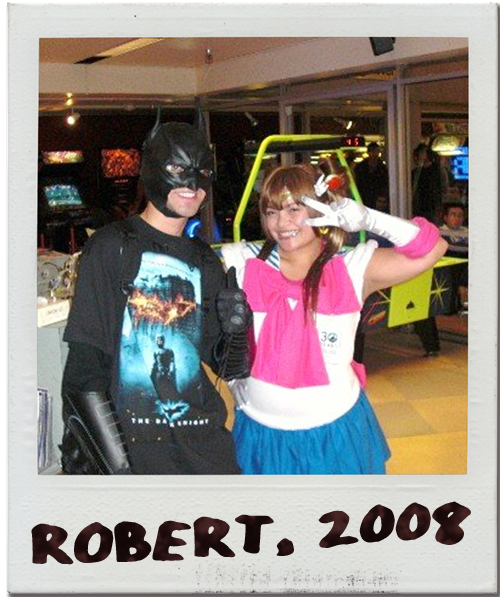 You could say I was more “Street” Batman because though I wore the iconic mask and gauntlets, most of my costume consisted of casual clothes, including a Dark Knight T-shirt. I went to class at SF State dressed as the Dark Knight and some students took notice of my costume. I also entered a costume contest that day and made a new friend. Her name was Geneive (Gen for short) and she looked awesome as popular anime heroine Sailor Moon. Once the contest concluded, I congratulated her and we took a picture together. We remain good friends to this day and keep in touch via Facebook. With regards to trick-or-treating, the best advice I can give any youngsters going out this year is to simply have a good time and stay close to whoever you go out with. Maybe even bring a flashlight to be safe, especially with how fast darkness falls this time of year. However, if you and your friends plan on dressing up as the Avengers, DO NOT go out without Captain America since he’s a vital part of the team (and if you saw the latest Halloween-themed episode of South Park, people might confuse your Hulk costume for a green Honey Boo Boo)! 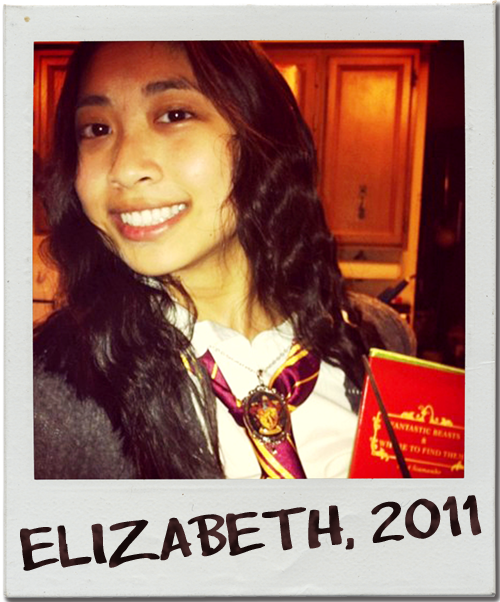 The photograph is of me dressed as Hermione Granger from Harry Potter! My favorite thing about Halloween is seeing all of the creative costume ideas. I especially love it when a team of people come together for a group costume, like that time when a bunch of my high school teachers dressed up as Scooby Doo characters! In 2009, I joked with a friend that I was going to dress up as Taylor Swift at the MTV VMAs and that he should dress up as Kanye West. Well, it ended up not happening on his end, but I had already bought all the stuff for my costume, so I still had to roll with it! 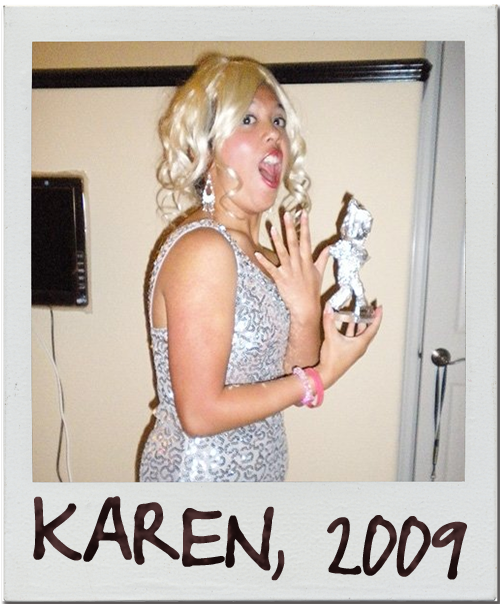 I bought a blonde wig and a cheap sparkly dress and I wrapped up one of my brother’s baseball player bobbleheads in aluminum foil as an ever-so-convincing Moonman. That Halloween was not a particularly good one for me, but I’ve had plenty of other fun late October madness in other years. I’m a fan of dressing up and a fan of candy—growing up, Halloween was definitely a time of the year that I looked forward to and I still enjoy it in some aspects to this day. One of my favorite Halloween memories is from my sophomore year of high school. I didn’t have a costume, but I really wanted to dress up, so I put on a hand-me-down formal dress and a tiara and carried around a baby doll. 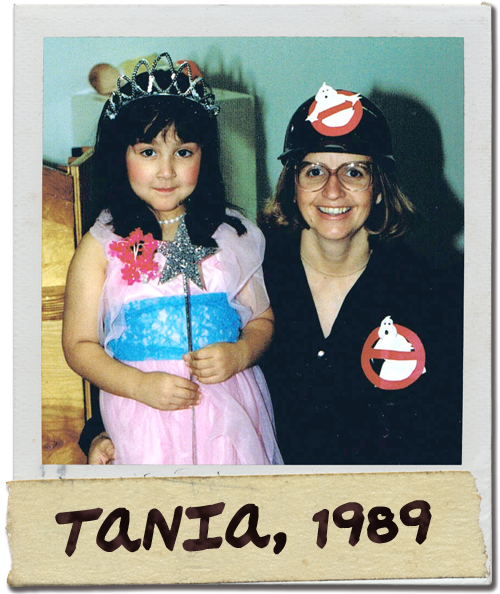 When people at school and people whose doors I knocked on while trick-or-treating asked me who I was, I just said “a prom queen with a baby.” That night, I visited a random haunted house on my friend’s block, dressed with props and filled with people dressed as ghouls who chased you around. It was cool because it was just a regular house in the neighborhood that was all set up for everyone to visit. My advice for trick-or-treaters is to make sure you don’t finish all the candy in one day (Let your supply last for when you need a sugar fix!) and to avoid going to the mall since many stores run out of goodies way too fast. Also, candy corn is actually useless, as are Almond Joys. Whether you go out trick-or-treating, attend a costume party with friends, or decide to sit in with a couple of movies (horror or not! ), we at The Hudsucker hope everyone has a great evening ahead of them. Halloween is more than just the candy and dressing up, it’s about having a little fun and however you go about it, we hope all of you are safe and take care!